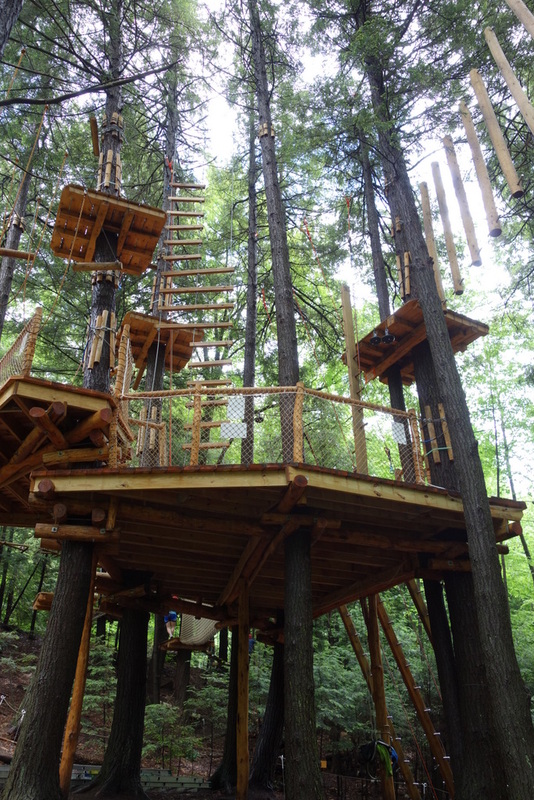 On Father’s Day, we’d planned a visit to Ramblewild, a new tree-to-tree adventure park in the Berkshires, right next to Jiminy Peak. I was super-excited for some family-bonding fun, and then. . . I wasn’t. It was a horribly rainy day, remember? I was concerned that perhaps I had ruined Cute W’s day by committing us to a rain-drenched activity. I didn’t need to worry. First of all, hello? It’s in a forest. That means plenty of leaf cover, and honestly? Hardly any rain reached us. Yes, things were a bit wet, but it was much better than I’d anticipated. And this is one of the aspects of Ramblewild that I love, that they are open year-round and rain or shine (only an electrical storm will shut them down). I do feel, sometimes, that we’ve got such an indoor culture that people tend to say, “Ugh, it’s January, I don’t want to be outside,” or “It looks like rain, so we can’t go for a walk.” And okay, yes: sometimes I do that, too. But I like the idea of embracing whatever’s outside and jumping into it. Kids love to jump in puddles and hunt worms in a rainstorm, and we only truly loved winter as a family once the kids started skating and skiing. So I was excited that Ramblewild is open even during the winter, complete with snowshoe rentals and fires outside to keep people toasty. Okay, I got off track. So I arrived worried, and pretty soon I was psyched again. First because the place is fabulous. It’s only recently opened, and the lodge is gorgeous and smells like wood, and everyone is friendly and helpful. It’s a bit of a hike from the parking lot/lodge area to the actual tree park, and we spent it getting a little tour of that patch of forest, with our guide giving us a quick natural history of the area and pointing out different varieties of trees. We also heard more about Feronia Forests and its other projects. Feronia Forests finds sustainable ways to make trees profitable without cutting them down. 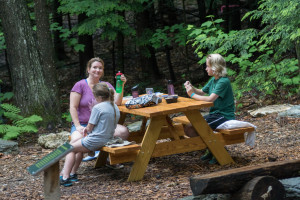 Along with Ramblewild, there are Mission:Maple products and Vertical Water, a water produced my maple trees, as well as the nonprofit Feronia Forward, which works with schools to get kids connected to nature. So, yay! Now, not only do you get to have fun, but we each get to feel like we’re The Lorax for having that fun. It’s a win-win. Okay, I already wrote an official review for KidsOutAndAbout, which you can find here. And, actually, I also read a couple of awesome reviews of Ramblewild here and here. I realized that I was doing quite a bit of basic introductory stuff, but here’s the stuff that you really don’t need to know, but maybe it will make you laugh. Basically, I came into this experience perhaps a bit too cocky. As I remember saying that time in college when I was drunk and casting off from the rail above a large flight of stairs, uneven-bar-style, my attitude is sometimes, “Don’t worry! I used to be a gymnast!” Alas, I used to be a gymnast a long time ago. It doesn’t feel like a long time ago, but if I count years. . . never mind. Shut up. But also, I felt cocky because I trusted the system. They have this Smart Belay system which makes it literally impossible to not be hooked onto something, and they do a little introduction on a mini ground-level course, and I was feeling good! And competent! And I was mostly competent. But also, arguably, the least competent member of my family. But I choose to argue that it was all cockiness and not lack of skill. Wait, have I ever told you that I used to be a gymnast? I have excellent balance. . . .
My first Fail was at the first zipline I encountered. 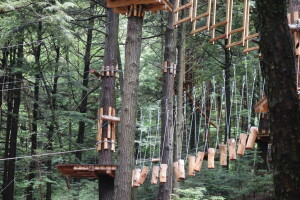 I guess, come to think of it, that the only other ziplines I’ve ever done landed on the ground. 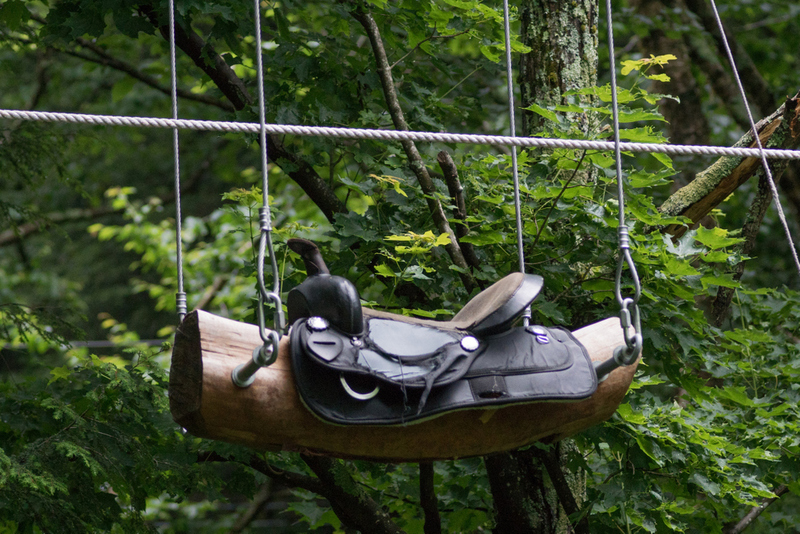 Incidentally, the ground is a profoundly sensible place to end a zipline. 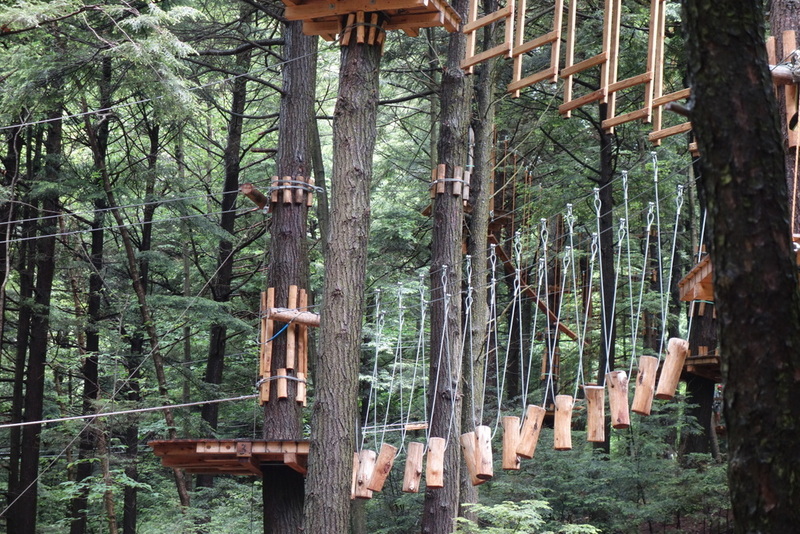 But this zipline ended on another platform, set right into the middle of the course. Now, for our first foray, we’d decided to have me go last. And I was looking around, having a good old time, and not noticing the Ramblehands, helpful staff members who are always nearby, ready to assist, coach, or cheer you if needed. In fact, one thing I really loved about Ramblewild is that you feel like you’re off on your own. 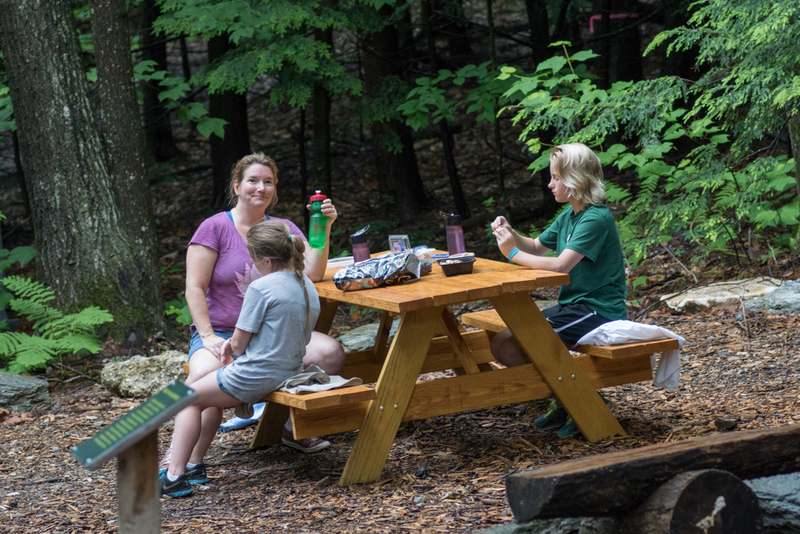 There are eight different courses to explore, all starting from a central hub (that’s a view of the hub above), and while the Ramblehands are around, you don’t have to stick with any particular group or have a guide lead you. That’s excellent. Loved it. But at the beginning, I didn’t really realize that the Ramblehands would offer up words of advice. And since I was the last of the four of us, I missed a crucial little piece of advice that was offered when the first of us approached. This was that it’s a good idea to grab something in order to stay on the platform. That, if someone failed to do this, she would start a slow-and-steady backslide into nowheresville. Oh, yeah. Maybe it was common sense. In any case, I could have ended up stranded there for the rest of the afternoon, but luckily a staff member threw me a rope and yanked me to where I was supposed to be. Phew. Okay, next: observe, if you will, this delightful little “element,” as they call it. It looks like a bunch of upright logs attached to wires. Now, as we approached this little beauty, some staff member called up some coaching. He suggested that the easiest way to get across was to wedge your foot between the side of the cylinder and the wires. Well, I thought, that might be easier, but it seems like cheating. Wouldn’t it be more challenging and fun to actually trip from log-top to log-top, lilypad style? Well, it was absolutely more challenging, but since I am not, actually, a tree frog or a butterfly, I managed to flip one of the logs and fall (thank you Smart Belay system for saving me! ), and because of the nature of this little element and the, umm, dramatic nature of my fall, I managed to get seriously tangled up in multiple logs-on-a-wire. And of course Cute W is right behind me and the Ramblehand below has been joined by a second one, because they are pretty sure that they’re already going to have to bail this lady out. But just like drunk-at-college Katie, I waved away all offers of assistance and managed to disentangle myself and proceed with as much dignity as I could muster. Which was, of course, not much. But more than if someone had to, I don’t know, get a ladder or something. 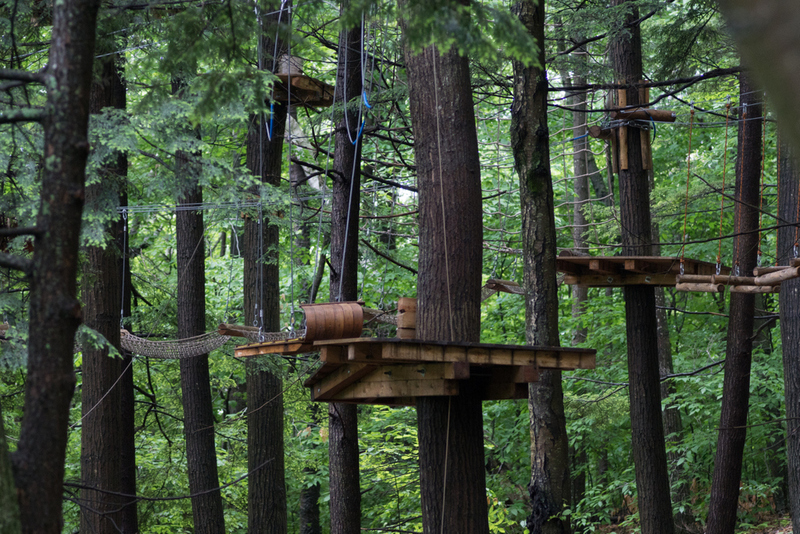 The Ramblewild folks figured you might get bored by just doing ziplines, so they offer other goofy options, like a skateboard or a trapeze. This one was a saddle that traveled over a stream. Super fun. Now, I mentioned before that grabbing onto something is a key element of tree-to-tree zipline success, and this one was a doozy. M was the first in the family to do it, which might have been a miscalculation if she weren’t totally and completely awesome. She somehow managed to jump off her pony and onto the platform, then stood ready to help her little sister J, who was next in line and didn’t quite have the arm length to manage it on her own. I was next. 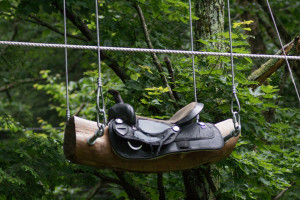 Now, if you’ll look closely, you’ll notice that the saddle is suspended with two horizontal poles attached to cables. The bad news is that I totally slammed my shin into one of these poles as I made my clumsy dismount. The good news is that, even though I slammed my shin, these moments were possibly my favorite of the entire day. M was yelling out orders, telling me what to do, grabbing the saddle, hustling me onto the platform, and giving me the update on J’s progress, all almost simultaneously. She was in full-on, adrenaline-filled, crisis mode. It was really adorable. And impressive. She was so awesome and helpful and Team Family that I got a little teary-eyed. Although, that could have been related to the massive swelling that was rising from my shin. And. . . oh, okay! 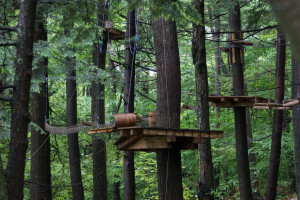 Here’s another crazy zipline, on a toboggan! And I put this one in here because, after I formed a massive bruise on my shin, I stood in just exactly the right place so that, when I waited on the platform to help J off the toboggan, it knocked directly into my bruise. Oh, that hurt. Also, it was only on the drive home that I learned that I was supposed to be bicycling my feet the entire time I was hanging from ziplines. That explains why I kept spinning around. “Mom,” M said, exasperated, “She told us that at very beginning!” Apparently I hadn’t been listening properly. “Wait,” I said, “I thought that they just meant at the end. You know, like the whole ‘Hit the ground running’ thing?” All three members of my family looked at me like I was crazy. Then Cute W launched into an explanation of how it was “simple physics” that he thought was common knowledge to most adult people. Like how that’s a bicycle works. I don’t think I ever, ever really considered how a bicycle works. This is one of the differences between my husband and me. But we had a terrific time! It was so fun. We only managed to make it through the four easiest courses during our three-hour visit. Then we had time for one more, and J wanted to re-do a favorite, and M thought she’d try the next level, and I was all, “Bring it!” because in spite of it all, I remained cocky. And then she literally climbed up the ladder to the next-level course, took a look at the first element, and changed her mind. At which point the kids went with Cute W one last time. In fact, J was a little bummed, because every time M was behind her she’d spend half the time saying, “Are you done yet? Can I go yet?” Which is annoying. And unnecessary, because you’re allowed to pass each other on the platforms. I chose to ignored that mild Sister Drama, and instead, I ran for my camera. Well, eventually I ran for my camera. First I had to climb down from the hub, and due to the Smart Belay system, which doesn’t allow you to completely unhook yourself until you’ve finished the course, a Ramblehand had to come and release me. Now that, folks, is some security! I’d absolutely love to go and try the tougher courses. Because I’m cocky! And because it was fun! I think it would be a great moms’ outing, too. And if you live close enough, they do memberships, like go play outside instead of going to the gym. If we lived closer I’d love that. Here we are enjoying a picnic I’d packed. I’m looking smug, because I’d totally planned an awesome Father’s Day, after all. Now, go over and look at the review on KidsOutAndAbout. Even if you’re tired of reading, there are more cute pictures! How old do the kids have to be to do the courses? I’m looking at their website and I can’t find an answer. My son is ten. He is dying to go. Wow! Ramblewild sounds awesome…just like this blog!